It was another frustrating evening for Morocco. The Lions of the Atlas had just been eliminated from the 2018 FIFA World Cup after a 1-0 defeat against Portugal on matchday 2. Overall, the World Cup has been a frustrating experience for Morocco – the squad collected just one point despite playing well in all three matches. Yet, among the players standing out was Real Madrid’s, Achraf Hakimi, who secured a loan deal to Borussia Dortmund on July 11. “Achraf Hakimi is a young, very dynamic full-back who has played at the highest level at Real Madrid and in the Moroccan national team,” explained BVB sporting director Michael Zorc on Borussia Dortmund’s official homepage. Just 19 Achraf Hakimi played all 270 minutes for the Lions of the Atlas. The Futbolgrad Network was present at Morocco’s second group stage game against Portugal. That particular evening the only difference between the two sides was a header by Cristiano Ronaldo after a corner-kick in what was a game between two very evenly matched sides. In fact, Morocco dominated much of the match without finding a way through a tightly knitted Portugal defence. In that match, Hakimi completed four tackles and managed one crucial interception. Hakimi’s attacking numbers were impressive – the 19-year-old wing-back managed a team-leading two key passes as well as two successful dribble attempts and completing 77.8% of his passes. With Morocco needing a goal Achraf Hakimi spent most of the match going forward but remarkably still managed to contain his direct opponent Bernardo Silva, who was playing on the right flank facing left-back Achraf Hakimi. The Portugal attacking-midfielder was mostly taken out of the match, which is no small part was due to Hakimi’s ability to contain the Manchester City star. Able to play on both the right and left flank Achraf Hakimi is a dynamic player whose abilities were somewhat summed up in the match. Although at home in a four-man defence Hakimi is an attacking wing-back of the Marcelo school. The Algerian, who was born in Madrid but chose to play for the country of his parents rather than Spain, is influenced by Real Madrid’s current wing backs. In Germany, wing-backs are referred to as Außenverteidiger, defensive wide-backs, but outside of Germany, the wing-back positions are often occupied by much more offensive thinking players. At Real Madrid, for example, left-back Marcelo has defined a dynasty by winning five Champions League trophies with the club. Former Real Madrid head coach Zinedine Zidane was also not shy of using the likes of Marco Asencio and Lucas Vázquez to occupy the wide-back positions in key matches. Hence, Achraf Hakimi comes from a wing-back school that is much more attacking minded than what is the definition of an Außenverteidiger in Germany – Germany, of course, also has a history of converting wing-backs but there is still greater emphasis on defending. 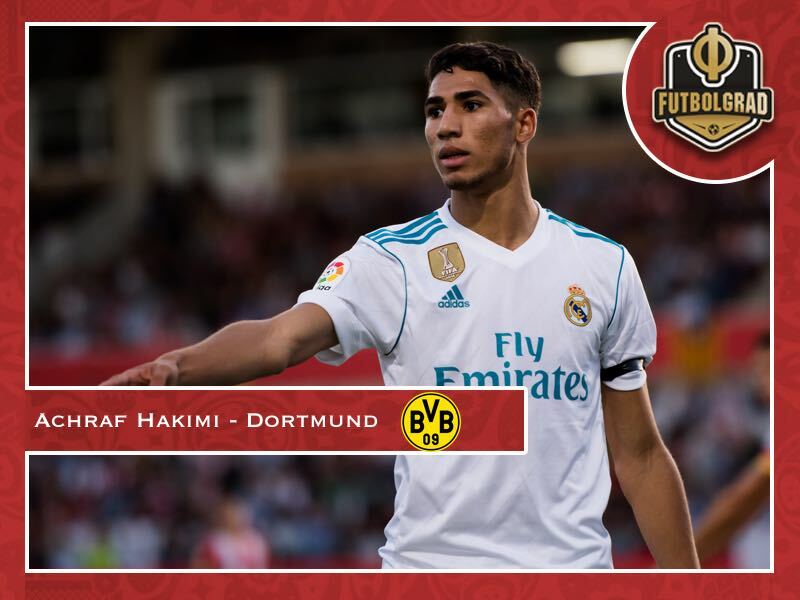 Perhaps it is for that reason that Achraf Hakimi is loaned out to Dortmund for two seasons. The experience of Daniel Carvajal, who spent one season with Bayer Leverkusen, showed Real that spending time on loan in Germany can benefit players by making them more complete wide-backs. That will indeed also be the case for Achraf Hakimi. As for Dortmund the Yellow and Blacks receive another talented player, who can act as a backup to the ageing Lukasz Piszczek and also put pressure on Jeremy Toljan. Toljan had a season to forget after being signed from Hoffenheim and could be on his way out in the light of this signing. In that regard, Hakimi’s arrival is a welcome addition. But at the same time, Dortmund are signing a player, who in the long-term will not provide a transfer windfall. At the same time, it was not easy to secure Achraf Hakimi. Many clubs around Europe tried to sign the Real Madrid talent. Hakimi did after all not just impress for his national team but also managed 17 appearances for Real in all competitions. Hence, Real wanted a perfect destination for Achraf Hakimi for the talent to make the next step in his development. In the end, Dortmund benefited from the close relationship between CEO Hans-Joachim Watzke and Real President Florentino Perez. Hakimi is already the sixth new signing for Dortmund, who continue their rebuild after having sold Yarmolenko to West Ham earlier today.